5 Oceans France, situated in Port-Pin-Rolland (30 Minutes from the Hyères /Toulon airport and a little over an hour from the Marseille airport), is the ideal starting point for a one day sail eastward toward the Golf of St. Tropez along the way passing the Iles d’Or and then westward onto the calanques of Cassis and Marseille. It is also a perfect place to repair or survey a yacht as there is a large travel-lift and a wide range of marine service professionals in the area. Port-Pin-Rolland is also the home of Catana’s warranty repair and after-market care services for Europe. Associate Broker Delphine Lafitte who manages the 5 Oceans’ office in France will assist you with all of your brokerage needs in Port-Pin-Rolland. Like so many young French children who grew up near the sea, Delphine Lafitte began sailing at a very young age on small dinghies. Her affinity for the water and wind was so strong that she became a sailing instructor in her early teens. This laid the foundation for her future life at sea. She became a mate on a large sailboat in her late teens and crossed the Atlantic twice. Those passages “under the stars” were enough to convince her that she had to pursue a career in yachting. She went on to obtain the very prestigious French Yacht Captains license and has, for the past ten years, served as a yacht captain – operating charters, delivering yachts all over the globe, and racing in the Mediterranean, Caribbean, Atlantic and South Pacific. She has experience on just about every type of yacht – large yacht, racing yacht, charter yacht, racing boat, etc. She has served on yachts ranging in size from 28 to 145 feet. An accomplished linguist, Delphine speaks fluent French, English, and Spanish. Delphine not only lists yachts for sale in Europe for 5 Oceans, but works closely with Alexis de Boucaud, our Florida Office manager, to serve the needs of European buyers looking to purchase a boat in the United States or the Caribbean. Delphine is a Francewarm, intelligent woman who loves to help others make their boating dreams come true. 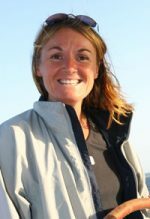 She speaks not only with a great depth of sailing experience, but with a true passion for the sea. As the world’s largest truly global brokerage company specializing in boat and yacht, 5 Oceans Marine Group is ready to assist you if you wish to buy or sell a boat in France, or anywhere in Europe.